Preparing to win his second WWE Championship precisely a year after he was 'retired' by the Ultimate Warrior, Macho Man Randy Savage foreshadowed his glorious victory over Ric Flair by sporting more gold that the title belt itself. It had been four years since Randy was entrusted with the company's top title (and all the responsibility that came with it), and just like in 1988, it came as Hulk Hogan prepared to temporarily exit stage left. Though lacking the physique he'd once sported during his 1980s pomp, Savage was able to look a million dollars through his attire rather than muscular frame. 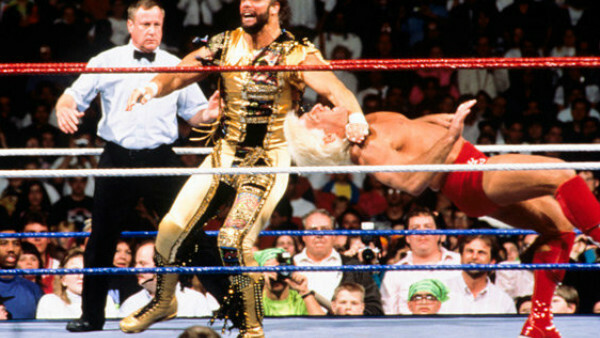 Selecting gold on top of gold on top of black on top of gold with all his usual ostentation, Savage sparkled inside WrestleMania 8's gorgeous Hoosier Dome yet still maintained the fiery temperament required to effectively sell the blood feud he'd rapidly developed with 'The Nature Boy'. The sight of Macho Man and Elizabeth's glittering title celebrations following the contest live long in the memory, and mark the final WWE pay-per-view in which they'd share the screen. With the pair about to divorce in real life, Elizabeth would appear at an upcoming European Tour then head home, never to work in the company again.